Modern Machine Shop 71 Deep-Hole Machining the machines trend large, workpieces don't have to be, he continues, explaining that table rigid- ity and overall volumetric precision eliminate the need to ensure that smaller workpieces (or features of those large enough to overhang the table) are located in a specific "sweet spot." Five-axis capability is a function of this rotary table as well as a dedicated, 50-taper, tilting mill- ing spindle mounted parallel to the machine's drilling spindle. 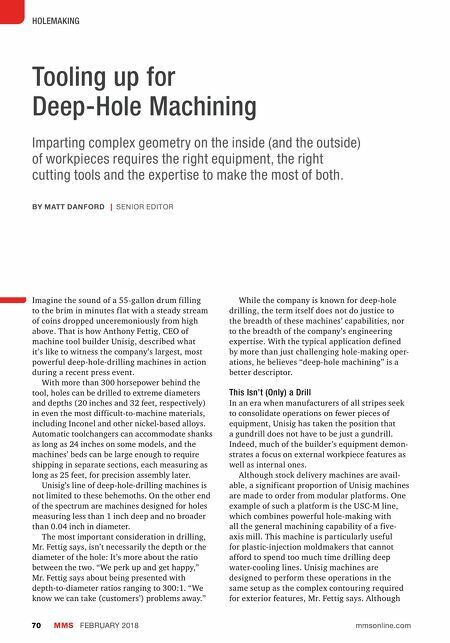 Machining is said to be just as precise—that is, volumetric accuracy is the same—regardless of the tilting spindle's angle and position within the workzone. "Performance and accuracy aren't compromised in seem- ingly less rigid headstock positions," he says. "Compound angles are effortless." He attributes this precision to scale feed- back and finely tuned, high-performance servo drives that facilitate precise interpolation. 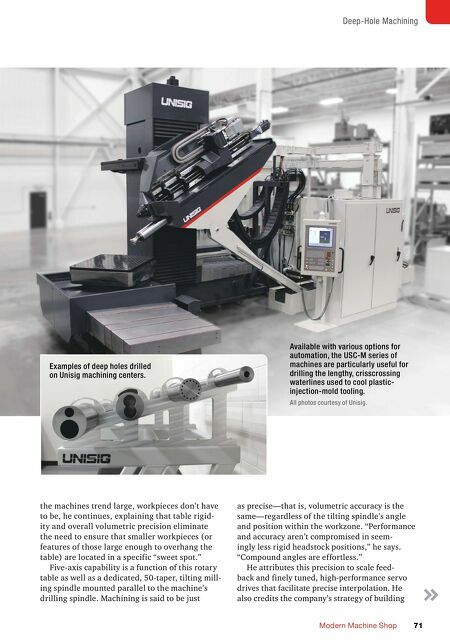 He also credits the company's strategy of building Available with various options for automation, the USC-M series of machines are particularly useful for drilling the lengthy, crisscrossing waterlines used to cool plastic- injection-mold tooling. All photos courtesy of Unisig. Examples of deep holes drilled on Unisig machining centers.